When I took these photographs, I was standing outside the ancient walls of San Gimignano in the Tuscany region of Italy with my shoes wet from the rain and my bones rattling from the cold. Deep inside I was wishing the sky was clear and the sun was at it’s late afternoon glow and bathing the rolling hills in golden light. Unfortunately it wasn’t the case so I set aside my disappointment and pulled out my iPhone 7 Plus then took multiple shots of the scenery before me with fingers crossed for some decent captures. The clouds somehow created a gloomy effect to the scenery something most people won’t picture Tuscany to be. Still I kept the photos but opted not to post them on this page for a long time until today. I realized I have lately been posting a number of my photographs taken during unpleasant weathers so I decided to revisit these photos and managed to convince myself to finally feature them on this page. After all, it isn’t always sunshine and blue skies in Tuscany…sometimes, the clouds need to roll in for some dramatic and special effects. When I visited Venice, Italy I prayed so hard for my trip not to end that I would wake up really early in the morning and stay up late at night just to stretch each day. The city was just magical…from the architecture, to the rich history and culture and of course the canals, which are uniquely Venice, making this city one of the most visited in the world. 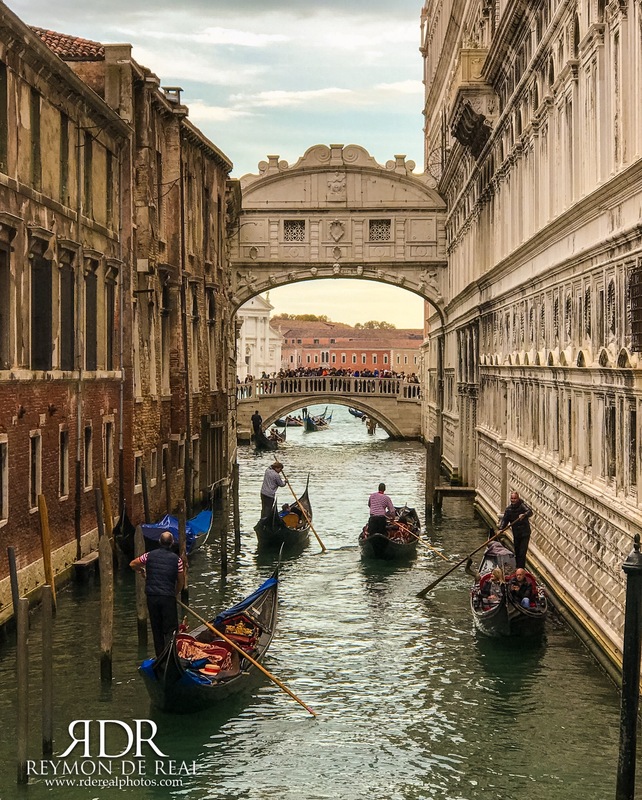 During my stay, I went to watch a Vivaldi concert at a theater right beside St. Mark’s Square, hopped on a gondola that cruised around the city and took long walks along narrow alleyways and across bridges connecting the multitude of islands that make up this remarkable city. I also joined a tour of the St. Mark’s Basilica and the Doge’s Palace and visited the former home of American socialite Peggy Guggenheim, which is now a museum showcasing her extensive art collection. Harry’s Bar, which was right beside my hotel, was also visited to try their signature Bellini and to check out the favorite hangout of Ernest Hemingway, Truman Capote, Charlie Chaplin and Alfred Hitchcock to name a few. The icing on the cake to my vacation was my suite at the luxurious Baglioni Hotel Luna, Venezia where my room had a view of the lagoon and my bathroom a view of the St. Mark’s bell tower. The hotel lived up to it’s five star reputation providing me with the famous Baglioni luxury and first class service. The photo above was taken in the front of the Peggy Guggenheim Museum while below are photos taken at Harry’s Bar, Peggy Guggenheim Museum and the Baglioni Hotel Luna, Venezia. 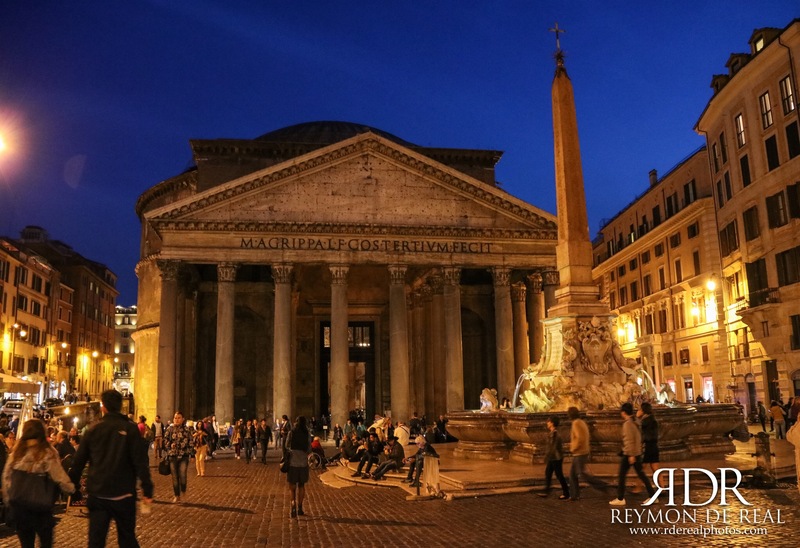 The Piazza della Rotonda is a city square in the heart of Rome where the ancient Pantheon majestically stands. The square features a central fountain surrounded by shops and restaurants where one can leisurely sit, eat and people watch. When in Rome, I always stay in this neighborhood at a hotel just right behind the Pantheon because every major landmark is just a few minutes away by foot. Walking around this neighborhood can be quite an experience…one gets magically transported to a different era while walking on cobblestone streets, through narrow alleyways and along historic buildings. I also personally enjoy walking around this plaza at night, which can be quite romantic with the golden lights illuminating the entire plaza just like in the photo above, which I took on my way back to the hotel after a hearty Italian dinner. So when in Rome, I never pass up the chance to enjoy a night in this beautiful piazza. Friends of mine are currently touring Italy and browsing through their pictures brought back pleasant memories of my vacation to this exquisite country last year. I immediately revisited my photo bank of the trip and discovered a good number of photographs worth posting in this page. My trip brought me to Rome, Florence, Tuscany and Venice before flying to Spain for the second half of my vacation. These places are rich in history and culture and my hundreds of photographs will never be able to give justice to the spectacular beauty I saw in person. 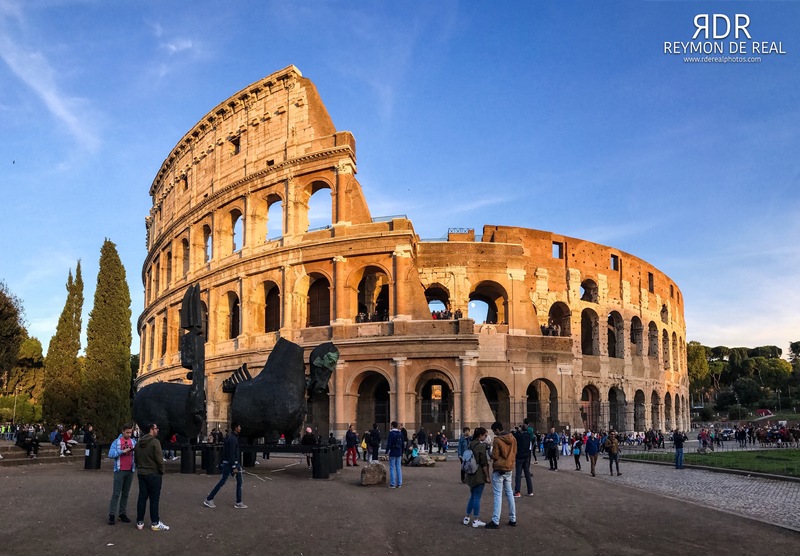 So the next series of photos on this site will feature photographs from my Italian trip beginning with the Colosseum right in the heart of Rome, which was recently cleaned up for a fresher look. This architectural wonder has become the city’s symbol and I captured it using my iPhone7 Plus in Pano mode in order to photograph the entire subject in a single shot. 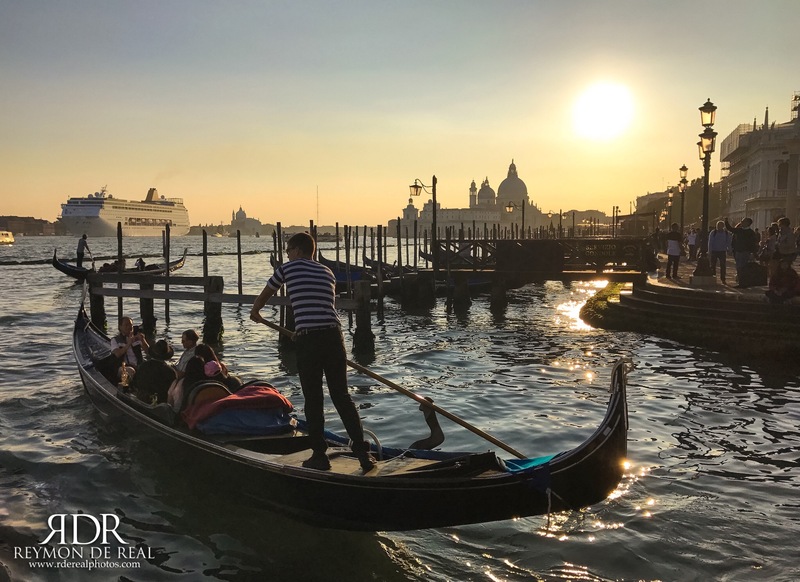 When in Venice, a gondola ride is quite inevitable…so during my trip to this floating city last October, I found myself sailing in one along this ancient city’s narrow canals. The sailing was smooth despite it being a tiny boat and was filled with pleasant surprises at every turn. Imagine my shock when in the middle of the tour the gondola glided out into the wide Venetian lagoon. I am not scared of sailing into open waters just as long as I’m in a huge boat…but when you’re in a tiny gondola rocking in a large body of water it wasn’t difficult to start panicking. Apparently, this was part of the route and the gondolier wanted to show me the Doge’s Palace from out in the lagoon when he found out I was into photography. It was a spectacular view indeed but I couldn’t help myself from clinging on the boat for life’s mercy. Despite being partially frozen in fear, I couldn’t miss the opportunity to take a photograph so I slowly pulled out my iPhone 7 Plus and took a number of shots. I was also too chicken to move to the opposite side of the boat so I ended up capturing a portion of the gondola, which surprisingly added an interesting perspective to my photographs…This one turned out to be my best and favorite shot. I always thought it was called the Bridge of Sighs because of the emotions it brought out of the viewers outside. However, I found out during my tour of the Doge’s Palace that it was called as such due to the emotions of the convicts crossing towards their prison cells seeing freedom for the last time…thus the sigh. The bridge is a key landmark in Venice as you can tell from the large crowd gathered on the bridge. I also stood on that bridge and took a number of photos but this one I took from the opposite side turned out better. The gondolas sailing towards the Venetian lagoon added a dramatic effect to the composition without taking away the focus from the bridge above. And just like everyone else who stood before this famous bridge, I took a sigh of appreciation for its beauty despite the tragic purpose of its very existence. 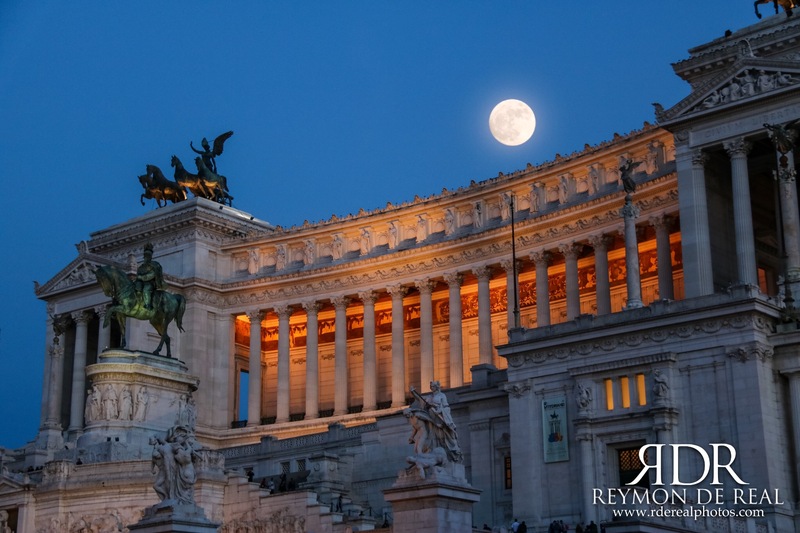 The full moon beautifully soared over the Altare della Patria or the National Monument to Victor Emmanuel II during my recent trip to the historic city of Rome. I took this photo just as I was turning on a corner while heading back to the hotel. I was hoping to photograph the moon above the Colosseum, however, the moon was way too high up in the sky by the time twilight made an entrance. Gladly, I looked back at the monument for a last gaze otherwise I would have missed the chance to photograph such a magical sight. The monument was illuminated at the right spots while the sky was at its perfect brightness and blueness to allow for the bright moon to pop out. What a beautiful night that was! The moon was at its fullest during my last night in Florence, Italy and the sky was blanketed with a thin veil of clouds creating a magical atmosphere in this medieval city in the heart of Tuscany. 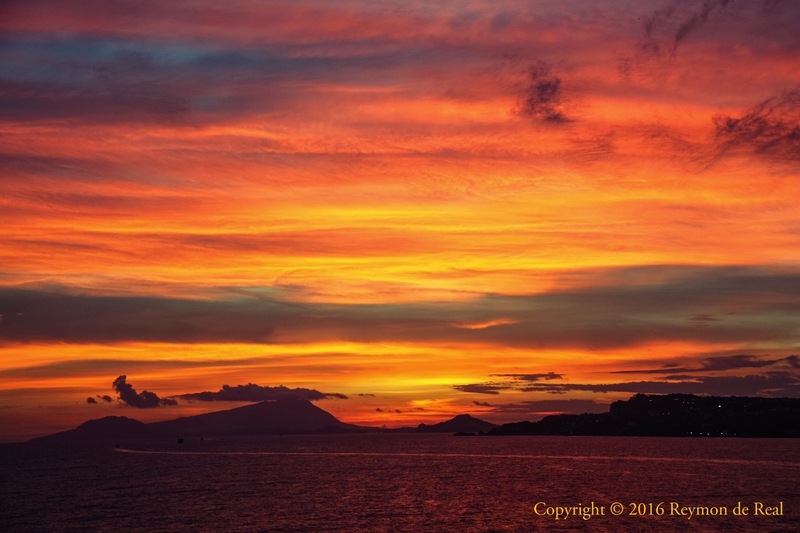 I initially wished the sky was clearer but I realized the clouds provided a dramatic effect to the night sky for my photography. My hotel (Hotel Spadai) had a viewing deck on it’s rooftop so I climbed up around midnight and happily clicked the night away without distractions from other hotel guests. 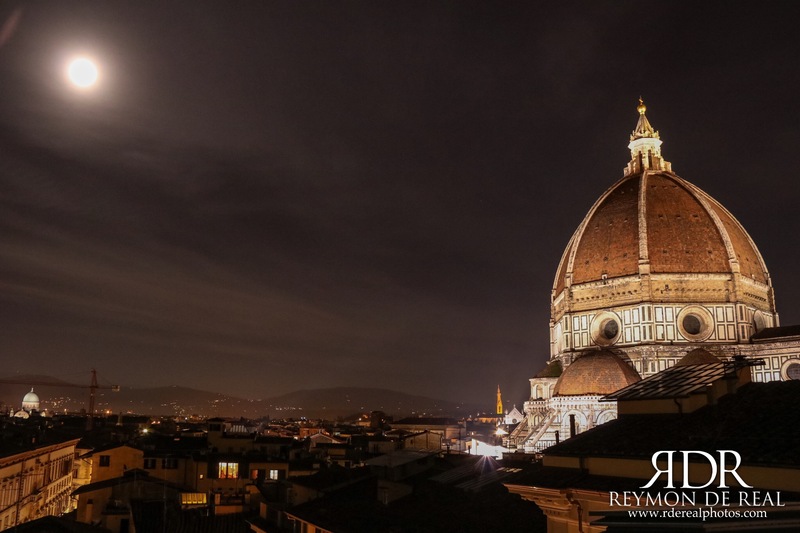 Fortunately, the moon was positioned close enough to the Duomo allowing me to capture both in a single shot. When I visited Rome two years ago, the Trevi Fountain was closed for renovation and the pool was totally drained of water. Visitors were able to walk on a ledge above the pool for a photograph and some were even throwing coins into the empty pool. I took a number of photos but none were worthy of a feature on my page. 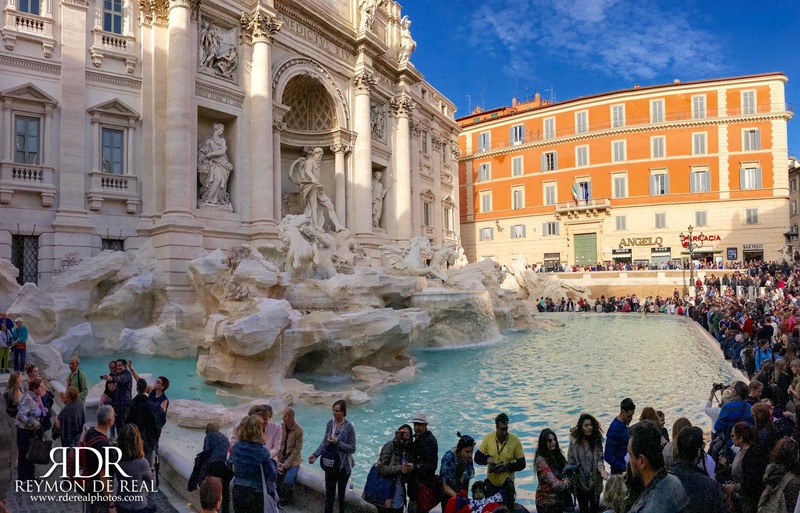 Two weeks ago I found myself again in Rome and this time I made sure the Trevi fountain was a major stop during my walk around the city. Unfortunately, my back was killing me after I pulled it while clearing my backyard for Hurricane Matthew that carrying a DSLR around my neck was intolerable. I had to use my iPhone 7 this entire trip so as not to aggravate my back. Surprisingly, using my iphone allowed me to capture wider panoramas like the photo above. I wouldn’t have been able to photograph the fountain in a wide span like this using an ordinary lens. I also wanted to capture the fountain devoid of tourists but my parents are not filthy rich enough to lock down the area so bear with the humanity bordering my photo. LOL! A week ago I arrived in Venice with very high expectations having known so much about this Italian city from movies, books and magazines. This was my first trip to this romantic city and true to my expectations, I was bowled over by what I saw. 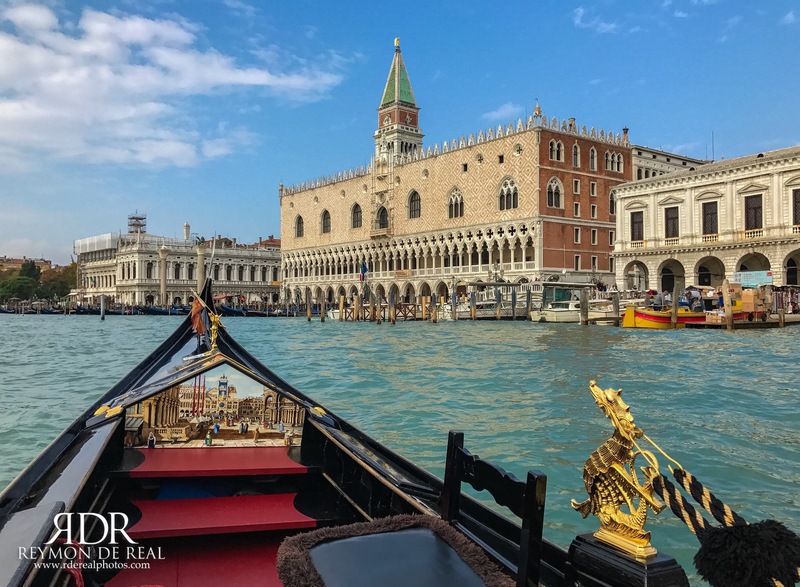 I may have to mention my wonderful stay at the Baglioni Luna Hotel, which made the entire experience more memorable, from the amazing service to my fabulous suite with a panoramic view of the Venetian lagoon (I will post a photographic review of the hotel later). A trip to Venice won’t be complete without a gondola ride and the tourist in me insisted that I had to give it a try. I found myself gliding through narrow canals between centuries-old buildings seeing a side of Venice one won’t get to see from the streets. Venice is such a beautiful city that I can’t find the right words to best describe it. This is one of those places that is better experienced than described. I am currently in the enchanting city of Florence and I’ve never said wow so many times in my life. This city in the heart of Italy’s Tuscany region was once a powerful kingdom and a major trading point in Europe. The city is rich in culture and traditions as well as impressive architecture such as the Basilica of Saint Mary the Flower with its behemoth of a dome towering above the city as seen in the middle of my photo. The city’s other famous landmarks include the Ponte Vecchio (bridge on middle left of the photo) and the Church of Santa Croce (middle right), which serves as home to the remains of famous Italians like Galileo, Michelangelo and Dante. 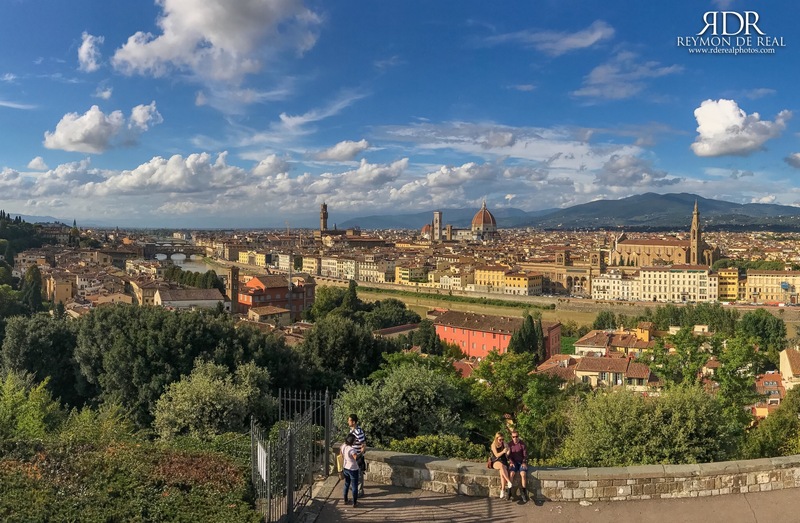 This photo was taken on top of a hill at the Piazza Michelangelo and the view from the top was worth every step of the climb. 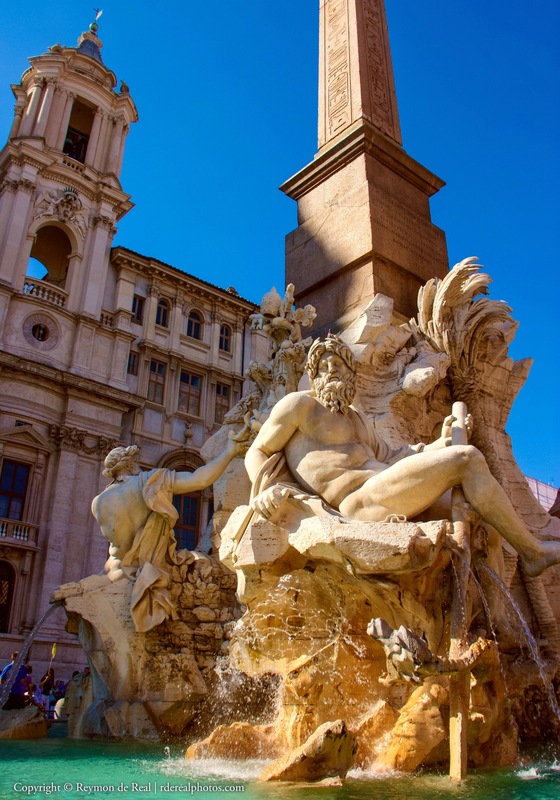 The Fountain of the Four Rivers created by Gian Lorenzo Bernini in 1651 is the centerpiece of Piazza Navona in Rome, Italy. This was the second major landmark I visited in Rome after the Pantheon, which was right behind my hotel. This impressive work of art represents the four major rivers of the four continents where the pope had supreme religious authority. These rivers are the Danube representing Europe, Nile representing Africa, Ganges representing Asia and Rio de la Plata representing the Americas. I was overwhelmed with emotions being in Rome for the first time and seeing all these monuments that I’ve only seen on pictures and films. Rome is such a beautiful city and photographs do not give justice to its real beauty. I may have taken at least 200 photos during my first five hours in Rome and I feel like I have not captured enough. I look forward to my next trip to Rome in a few months and I hope to capture a few hundred more photos to share with you all. 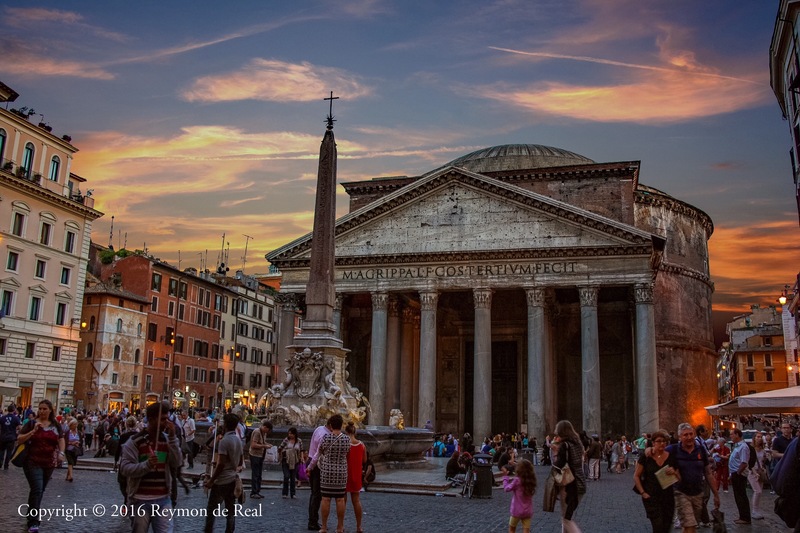 The Pantheon in Rome is an ancient structure constructed around 127 AD by Emperor Hadrian. It is one of the best preserved ancient buildings in Rome and was continuously used throughout its existence. The building is now a Catholic Church and houses the tombs of two Italian kings (Vittorio Emanuele II and Umberto I) and that of the great artist Raphael. The square in front of the Pantheon is called Piazza dela Rotunda and features a fountain surmounted by an Egyptian obelisk. This is the first place I visited in Rome just because it was right behind my hotel. The place is a major tourist attraction so it can get really crowded and one may have to line up to get inside the building. The square is surrounded by restaurants and cafes where you can drink and dine al fresco as well as have fun people watching. I took this photo when I was still experimenting with the manual mode of my camera and two shots came out surprisingly good so I decided to combine them to come up with this. I’m going back to Rome later this year and this time I know my manual mode better…let’s all hope I come up with better shots this time.